Sophia Louisa Jex-Blake (21 January 1840 – 7 January 1912) was an English physician, teacher and feminist. 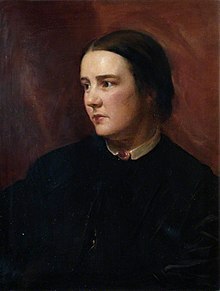 She led the campaign to secure women access to a University education when she and six other women, collectively known as the Edinburgh Seven, began studying medicine at the University of Edinburgh in 1869. She was the first practising female doctor in Scotland, and one of the first in the wider United Kingdom of Great Britain and Ireland; a leading campaigner for medical education for women and was involved in founding two medical schools for women, in London and Edinburgh at a time when no other medical schools were training women. 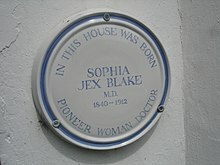 A plaque commemorating the birthplace of Sophia Jex-Blake. Sophia Jex-Blake was born at 3 Croft Place Hastings, England on 21 January 1840, daughter of retired lawyer Thomas Jex-Blake, a proctor of Doctors' Commons, and Mary Jex-Blake née Cubitt. Her brother was Thomas Jex-Blake, future Dean of Wells Cathedral. Until the age of eight she was home-educated. She attended various private schools in southern England and in 1858 enrolled at Queen's College, London, despite her parents' objections. In 1859, while still a student, she was offered a post as mathematics tutor at the college where she stayed until 1861, living for some of that time with Octavia Hill's family. She worked without pay: her family did not expect their daughter to earn a living, and indeed her father refused her permission to accept a salary. The following month Sophia Jex-Blake travelled to the United States to learn more about women's education. She visited various schools, was strongly influenced by developments in co-education in the US and later published A Visit to Some American Schools and Colleges. At the New England Hospital for Women and Children in Boston she met one of the country's pioneer female physicians, Dr Lucy Ellen Sewall, who became an important and lifelong friend, and she worked there for a time as an assistant. This was a turning point for Jex-Blake as she realised, during this visit, that to become a doctor was her life's vocation. In 1867, along with Susan Dimock, a trainee from the New England Hospital, she wrote directly to the President and Fellows of Harvard University requesting admission to the University's Medical School. They received their reply a month later, in a letter which stated: "There is no provision for the education of women in any department of this university". The following year, she hoped to attend a new medical college being established by Elizabeth Blackwell in New York, but in the same year her father died so she returned to England to be with her mother. In 1869, Jex-Blake's essay Medicine as a profession for women appeared in a book edited by Josephine Butler: Women's Work and Women's Culture. In this she argued that natural instinct leads women to concern themselves with the care of the sick. However, with education of girls being restricted to domestic crafts, women generally could not qualify to compete with men as medical practitioners. However, she argued that there was no objective proof of women's intellectual inferiority to men. She said that the matter could easily be tested by granting women 'a fair field and no favour' - teaching them as men were taught and subjecting them to exactly the same examinations. Sophia Jex-Blake was determined to seek medical training in the UK and due to Scotland's already enlightened attitudes towards education, felt that if any university would allow women to study it would be a Scottish one. 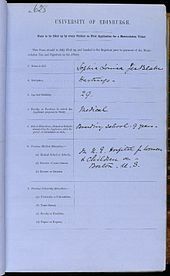 She applied to study medicine at the University of Edinburgh in March 1869 and although the Medical Faculty and the Senatus Academus voted in favour of allowing her to study medicine, the University Court rejected her application on the grounds that the University could not make the necessary arrangements 'in the interest of one lady'. Jex-Blake's application for matriculation, submitted to the University of Edinburgh and held in their archives. She then advertised in The Scotsman and other national newspapers for more women to join her. A second application was submitted in the summer of 1869 on behalf of the group of five women initially (with two more joined later in the year to make the Edinburgh Seven). It requested matriculation and all that that implied - the right to attend all the classes and examinations required for a degree in medicine. This second application was approved by the University Court and the University of Edinburgh became the first British university to admit women. "It is a grand thing to enter the very first British University ever opened to women, isn't it?" As the women began to demonstrate that they could compete on equal terms with the male students, hostility towards them began to grow. They received obscene letters, were followed home, had fireworks attached to their front door, mud thrown at them. This culminated in the Surgeons' Hall riot on 18 November 1870 when the women arrived to sit an anatomy exam at Surgeons's Hall and an angry mob of over two hundred were gathered outside throwing mud, rubbish and insults at the women. The events made national headlines and won the women many new supporters. However, influential members of the Medical faculty eventually persuaded the University to refuse graduation to the women by appealing decisions to higher courts. The courts eventually ruled that the women who had been awarded degrees should never have been allowed to enter the course. Their degrees were withdrawn and the campaign in Edinburgh failed in 1873. Many of the women went to European universities that were already allowing women to graduate and completed their studies there. Dr Sophia Jex-Blake has made the greatest of all contributions to the end attained. I do not say that she has been the ultimate cause of success. The ultimate cause has been simply this, that the time was at hand. It is one of the lessons of the history of progress that when the time for reform has come you cannot resist it, though if you make the attempt, what you may do is to widen its character or precipitate its advent. Opponents, when the time has come, are not merely dragged at the chariot wheels of progress - they help to turn them. The strongest forces, whichever way it seems to work, does most to aid. The forces of greatest concentration here have been, in my view, on the one hand the Edinburgh University led by Sir Robert Christison, on the other the women claimants led by Dr Sophia Jex-Blake. In 1874, Sophia Jex-Blake helped establish the London School of Medicine for Women but also continued campaigning and studying. The Medical Act (39 and 40 Vict, Ch. 41) soon followed, which was an act to repeal the previous statute while also permitting medical authorities to license all qualified applicants whatever their gender. The first organisation to take advantage of this new legislation was the Royal College of Physicians of Ireland, but before Jex-Blake applied to them, she passed the medical exams at the University of Berne where she was awarded an MD in January 1877. Four months later she had further success in Dublin and qualified as Licentiate of the King's and Queen's College of Physicians of Ireland (LKQCPI) meaning she could at last be registered with the General Medical Council, the third registered woman doctor in the country. 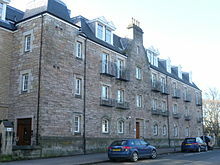 Jex-Blake returned to Edinburgh where she leased a house at 4 Manor Place and in June 1878, put up her brass plate – Edinburgh had its first woman doctor. Three months later she opened an outpatient clinic at 73 Grove Street, Fountainbridge, where poor women could receive medical attention for a fee of a few pence. After her mother's death in 1881, Sophia Jex-Blake had a period of depressed reclusiveness, but in 1886 set up the Edinburgh School of Medicine for Women. The Dispensary expanded by 1885 was moved to larger premises at 6 Grove Street where a small five-bed ward was added. The little outpatient clinic thus became the Edinburgh Hospital and Dispensary for Women. This was Scotland's first hospital for women staffed entirely by women. Two years later she established the Edinburgh School of Medicine for Women. Effectively a small extramural class, it was largely enabled by a small handful of pro-female male physicians linked to the University of Edinburgh giving extramural classes open to men and women (which the university could not prevent). The first students included Elsie Inglis, Grace Ross Cadell and her sister Georgina, but Jex-Blake's skill as a teacher did not match her role as a doctor. An acrimonious split emerged with her students culminating in an infamous court case in 1889, where Jex-Blake was successfully sued for damages. Thereafter the Cadell sisters pursued their studies with the more genial, though far younger, Elsie Inglis who had set up a rival school, the Edinburgh College of Medicine for Women. Jex-Blake's school came to an effective end in 1892 when the University of Edinburgh began taking female students, while the Elsie Inglis College continued until 1916, when it merged with the Royal Colleges School of Medicine at Surgeons' Hall. Sophia lived and conducted her practice for 16 years in the house known as Bruntsfield Lodge on Whitehouse Loan. When she retired in 1889 the Edinburgh Hospital and Dispensary for Women and Children moved to this site, and became known as Bruntsfield Hospital, where it continued to function on the site until 1989. Jex-Blake's romantic partner was Dr Margaret Todd. On Jex-Blake's retirement in 1899 they moved to Windydene, Mark Cross, Rotherfield, where Dr Todd wrote The Way of Escape in 1902 and Growth in 1906. Her home became a meeting place for former students and colleagues, and she welcomed writers and acquaintances from the world over. Jex-Blake died at Windydene on 7 January 1912 and is buried at Rotherfield. Todd subsequently wrote The Life of Dr Sophia Jex-Blake. The University of Edinburgh commemorates Sophia Jex-Blake with a plaque (by Pilkington Jackson) near the entrance to its medical school, honouring her as "Physician, pioneer of medical education for women in Britain, alumna of the University". In 2015, an Historic Scotland plaque was unveiled to commemorate the Surgeons' Hall Riot of 18 November 1870. Jex-Blake, Sophia (1867). A Visit to Some American Schools and Colleges. London: Macmillan and Company. Jex-Blake, Sophia (1872). Medical Women: A Thesis and a History. Jex-Blake, Sophia (1877). Puerperal Fever: an Inquiry into its Nature and Treatment: A Graduation Thesis. Jex-Blake, Sophia (1884). The Care of Infants: A Manual for Mothers and Nurses. London: Macmillan and Company. Allen, Maggie; Elder, Michael (1981). The walls of Jericho – a novel based on the life of Sophia Jex-Blake. ISBN 978-0-563-17929-0. Ogilvie, Marilyn Bailey (1990). "Women in Science: Antiquity through Nineteenth Century A Biographical Dictionary". Massachusetts, USA: MIT. Lovejoy, Esther Pohl (1957). Women Doctors of the World. London: Macmillan. Roberts, Shirley (1993). Sophia Jex-Blake. London: Routledge. Roberts, Shirley (2004). "Sophia Jex-Blake". Oxford Dictionary of National Biography. McCullins, Darren (16 November 2018). "Blazing a trail for first women doctors". BBC News. ^ "Jex-Blake, Sophia". Who's Who. Vol. 59. 1907. pp. 938–939. ^ Knox, William (2006). Lives of Scottish women. Edinburgh: Edinburgh University Press. p. 71. ISBN 9780748617883. ^ Roberts, Shirley (1993). Sophia Jex-Blake : a woman pioneer in nineteenth-century medical reform (1. publ. ed.). London u.a. : Routledge. ISBN 978-0-415-08753-7. ^ British Medical Journal. British Medical Association. 1908. pp. 1079–. ^ John A. Wagner Ph.D. (25 February 2014). Voices of Victorian England: Contemporary Accounts of Daily Life. ABC-CLIO. pp. 211–. ISBN 978-0-313-38689-3. ^ Great Britain. Parliament. House of Commons (1892). Parliamentary Papers, House of Commons and Command. H.M. Stationery Office. pp. 40–. ^ Lutzker, Edythe (1969). Women Gain a Place in Medicine. New York: McGraw Hill. p. 149. Wikimedia Commons has media related to Sophia Jex-Blake. "Miscellany#Prof. Huxley on Female Education" . Popular Science Monthly. Vol. 5. October 1874. ISSN 0161-7370 – via Wikisource. the first group of matriculated undergraduate female students at any British university.